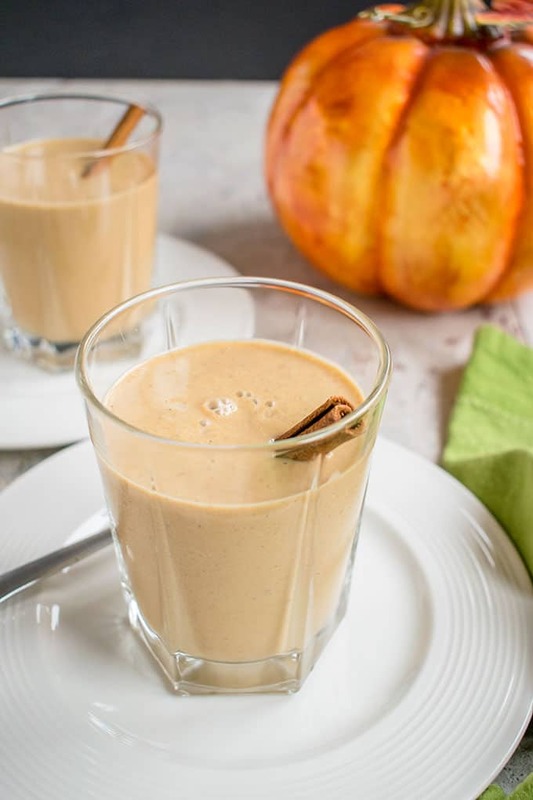 If you love pumpkin, you have to try this healthy pumpkin smoothie! It’s made with almond milk, a banana, walnuts, vanilla and warm spices for a delicious vegan breakfast. Are you a pumpkin lover? I’m the type who gleefully throws canned pumpkin in my grocery cart during the first week of August. Honestly, it’s because of this delicious pumpkin smoothie. I can’t wait until fall to make it. You may recall I make healthy, vegan, smoothies for breakfast in my Vitamix (affiliate link) six days a week. It’s one of my tricks to keeping my weight under control. So, I’m constantly thinking of seasonal smoothies to whip up to prevent breakfast boredom. 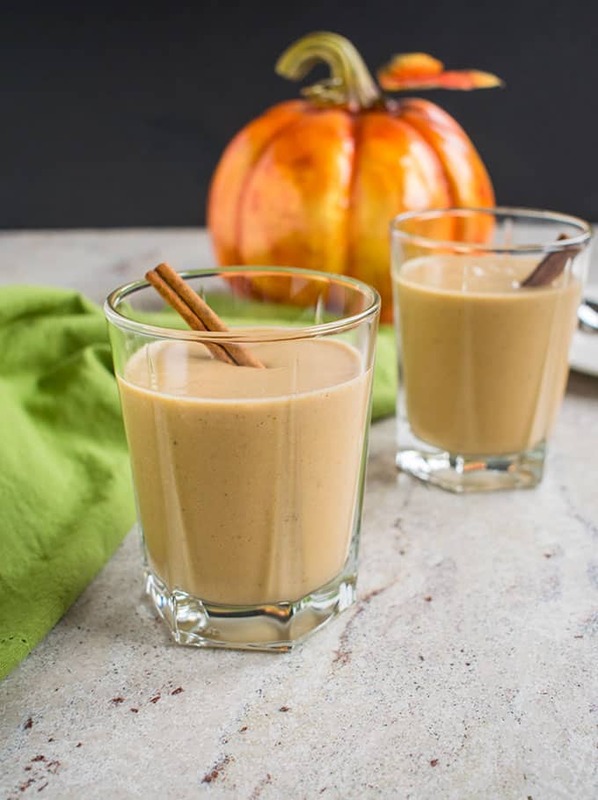 I’ve been making this skinny pumpkin smoothie for four years! It’s basically pumpkin pie in a glass…without the guilt. I originally published this “pumpkin delight smoothie” in 2014, when I barely knew how to operate my camera. It was time for some updated photos and a nice, new recipe card with nutrition info. Can you believe I’m the only one in my household who likes pumpkin? I find this so strange. Growing up, my brother, Dad, and I always looked forward to Mom’s pumpkin pie, which she made every year during the week of Halloween, and sometimes at Thanksgiving too. It never, ever occurred to me there were people who didn’t enjoy pumpkin. In fact, my ignorance led to an awkward newlywed moment 21 years ago. Anyway, there was a recipe for a frozen, layered pumpkin dessert with ice cream and ginger snaps. Yum! So, being an earnest new wife who wanted to impress my husband, I made this fabulous dessert. I was so excited! I eagerly watched my husband as he took a spoonful, waiting for his reaction…which was nothing. He just silently, dutifully ate the dessert. “How is it?” I asked, thinking maybe he was so engrossed in eating that he had forgotten to pay me a compliment. “I don’t like pumpkin, but it’s OK,” he confessed. There was an uncomfortable silence. I felt bad for a moment. Then I wondered how I hadn’t known this sooner. And who doesn’t like pumpkin?! But then, realizing I would have the entire dessert all to myself, I quickly recovered. And yes, I ate that trifle bowl of frozen pumpkin goodness for two weeks straight. Nowadays, I still need my pumpkin fix, but I can’t afford to eat party-sized desserts by myself. So, at this time of year, a 15-ounce can of pumpkin is my BFF. 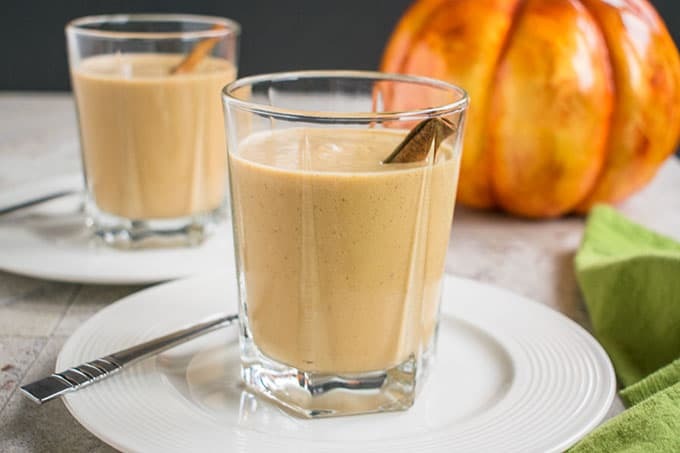 Just three heaping tablespoons (I use the regular silverware), plus cinnamon, ginger and walnuts, turn my morning banana smoothie into a guilt-free, pumpkin smoothie. I store the leftover pumpkin in the refrigerator, and I get four consecutive days of creamy, dreamy pumpkin bliss for breakfast. The best part is, I don’t have to share it with anyone. P.S. If you love pumpkin, you have to try my Pumpkin-Orange French Toast and Peachy Pumpkin Scones! 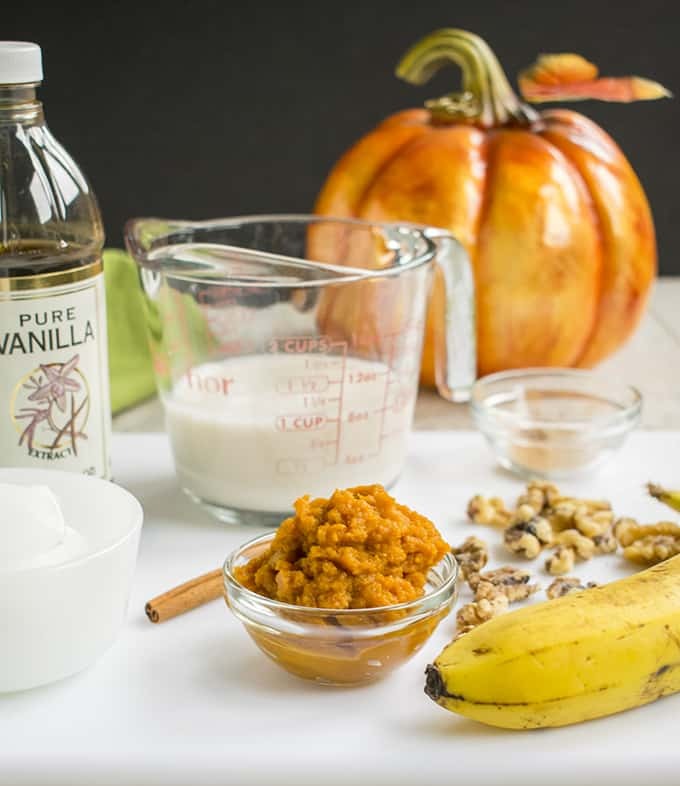 You'll love this delicious & healthy pumpkin smoothie! Place ingredients in a blender and mix until smooth. Store leftover pumpkin in the refrigerator and use within five days. I'm counting this whole recipe as one serving, since I usually drink it all. You can get two smaller servings as a snack if you wish. 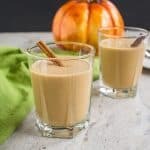 Pumpkin smoothies sound great for a morning start!!! I’m starting my day with one now…Thanks, Tisha! 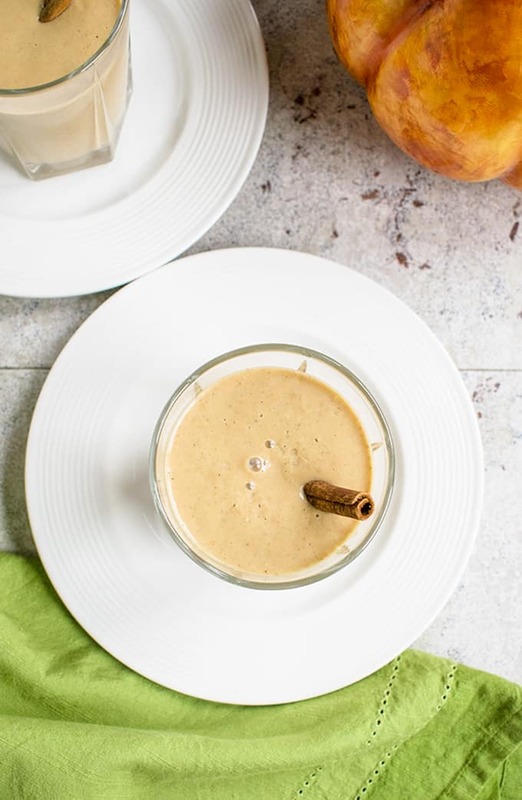 Ooh – a smoothy that tastes like pumpkin pie?!? Sign me up… pinning to try once it is finally fall here in NC! Thanks for pinning it, Meredith. I hope you enjoy it! I love pumpkin anything! My goal is to try new recipes with pumpkin in them this year, this is at the top of my list! I like that goal! I want to try pumpkin and chocolate. I hope you love this smoothie, Sharon! I love pumpkin spiced drinks! Trying this one tomorrow! Thank you! I hope you enjoy it, Jessie! I love pumpkin everything!! 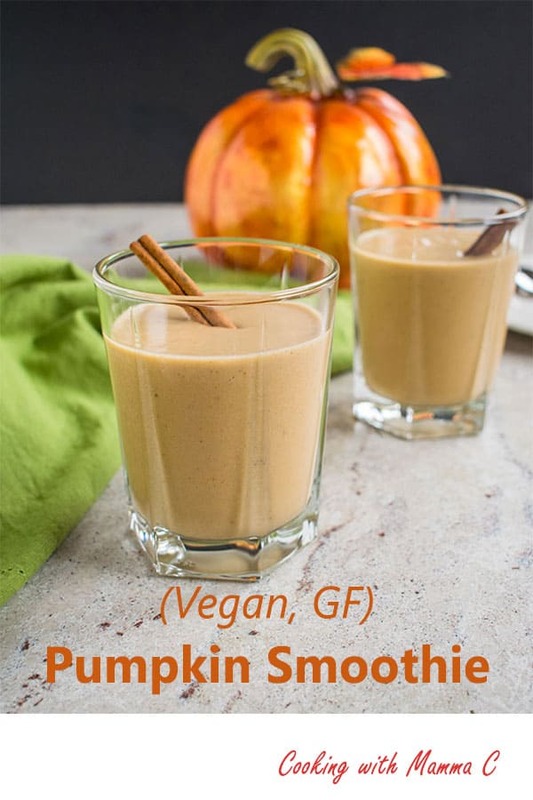 This smoothie is perfect for getting my pumpkin fix. It’s perfect and guilt free! Thanks, Pam.